View frequent questions regarding self-move and corporate moving services for company employees. For additional information and questions, please do not hesitate to contact our Corporate Relocation team! Who Owns Moving Ahead Services? Moving Ahead is independently owned and operated. Why Choose Moving Ahead for Corporate Relocation? Our commitment to quality and value shines through every single move we complete. Our corporate customers enjoy flexible packages, open and available communication, the best in service and support and other benefits that contribute to a successful moving experience for each transferee. 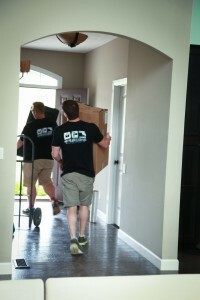 What Corporate Moving Services are Offered to Clients? Our service menu extends beyond the typical relocation services. In addition to professional moving and packing services, we have licensed agents on staff to handle your real estate needs. We also offer on-site storage, moving supplies, cleaning services, junk removal, post-move and handyman services as well as having a network of outside service providers to tend to virtually any need during a relocation. Who is Actually Moving my Items? Moving Ahead Services employers movers and drivers that have been screened and background checked. Moving independently with Moving Ahead means your items never leave our care. From the time the first box is packed and loaded until you step into the front door and officially move into your home, our trusted providers are in complete control. Are you Appropriately Licensed and Insured? Yes of course. In addition to the proper DOT/PUC /MC licenses, and insurance coverage, we adhere to the strictest of safety and service standards. Do You Offer Move Management Services? Yes, in fact our communication and organization coupled with industry leading technology make Moving Ahead an excellent choice for your corporate relocation. For company professionals managing employee moves to transferees themselves, we are committed and available, ensuring every detail is tended to before, during and after your move. Is Lump Sum Relocation Available? Yes, our lump sum services offer a variety of options to match the needs of each unique employee move. From a dedicated move planner to flexible pricing and packages, lump sum packages at Moving Ahead Services are unrivaled in the industry. Begin by completing the Corporate Relocation form on our site above, and a member of our customer service staff will be in touch immediately. Alternatively, call our offices at 1-877-643-4044. Commercial and Residential moving services in Ohio and beyond. Personal, military and corporate moving services, packing, supplies, storage and more.